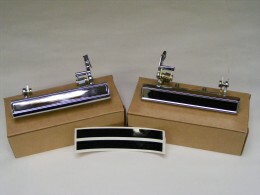 This is a set of reproduction inner & outer door window sweeps with THIN chrome bead. These are the seals the go on the outside of the door and screw on to the hull of the door and have a small chrome strip that runs along the door. 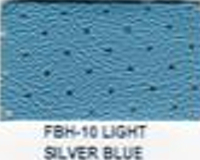 These are sometimes called the window felts. They squeegee the outside of the window when the glass is rolled down. These are correct O.E. style felts. MCI's window felts are made from new tooling to ensure a proper fit and appearance. 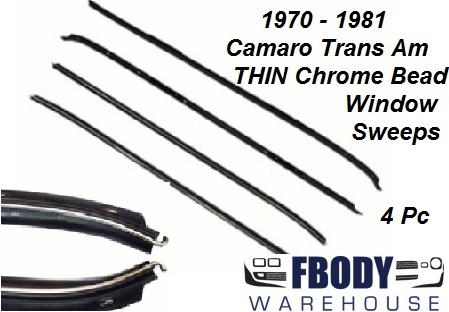 Four piece kit including correct original round exterior bead chrome and correct flat chrome bead on the door panel mounted inner weather seal sweep. These are correct O.E. style felts. MCI's window felts are made from new tooling to ensure a proper fit and appearance. 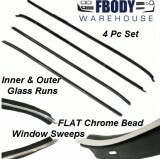 Four piece kit including correct original round exterior bead chrome.